Does Glue Actually Contain Gluten? Generally speaking, glue isn't something children and adults with celiac disease and non-celiac gluten sensitivity need to worry too much about. But there are some exceptions to this rule. Wheat flour actually makes pretty awesome glue (ever experiment with paper mache? ), and back in the olden days, some glues—especially homemade glues — did contain wheat flour as a component. However, even back then, animal proteins from bones and connective tissues made up the bulk of glue. Old milk also served as a major glue ingredient. These days, however, almost all glues I've encountered on the market are made from synthetic materials, not from materials derived from plants or animals. Elmer's, perhaps the most common brand of household glue in the United States, says in its frequently asked questions that all of its glues are gluten-free. More specialized glue products such as epoxies definitely won't include any gluten in them, so you don't need to worry about those at all, at least from a gluten standpoint—some specialized epoxies I've used contain hazardous materials that require different kinds of precautions. You should make certain to avoid homemade glues and paper mache paste because they almost certainly will contain gluten. 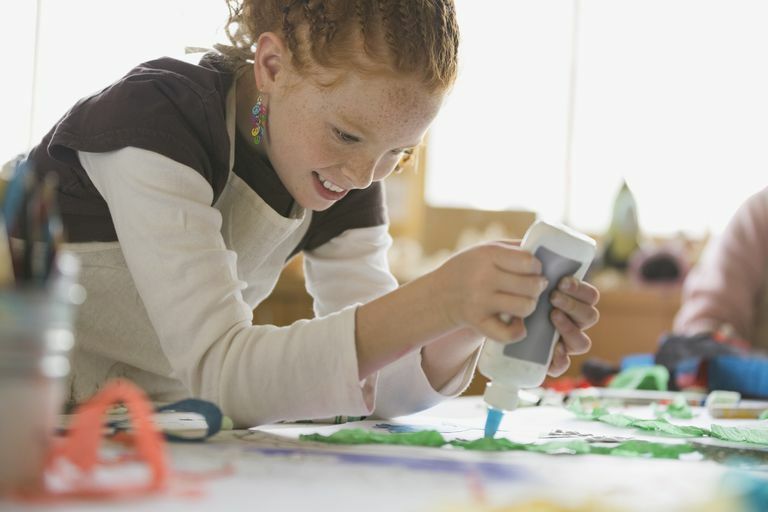 Don't let your child participate in paper mache projects at school. Even if you warn her not to eat the stuff, she's still at risk for becoming ill from inhaling airborne gluten as it's being mixed and used. There also are adhesives used in home-building and renovation that include wheat as an ingredient: wallpaper paste and some tile grout products represent a risk. Now, you're obviously not going to eat these products, but you can inhale gluten when you work with them, especially if you're removing dried paste and old grout. If you plan to hang wallpaper, you should look for a wallpaper paste made primarily from a clay base; these pastes, which usually come in tan or grey, will work best with vinyl or foil wallpapers. Meanwhile, most home improvement stores carry grout made from synthetic materials (although it's generally the most expensive option). There's one other category of glue that may pose a concern for us: envelope and stamp glue. The Envelope Manufacturers Association says that glue on envelopes is made from cornstarch and doesn't contain wheat or rye gluten (I don't know why they don't mention barley, too). However, I do know someone who used an EZ Gluten home testing kit on an envelope and got a positive result, which would indicate the glue contained more than 10 parts per million of gluten, assuming the test was done properly. It honestly wouldn't shock me to learn that the manufacturers of envelope and stamp glue were not terribly careful about keeping wheat grains out of the corn they use (or even to learn that they occasionally substituted wheat when corn was expensive). Fortunately, there's a simple solution: Buy self-seal envelopes and peel-and-stick stamps. Envelope glue may be a minor risk (or possibly not a risk at all), but if it is a risk, it's one that's awfully easy to avoid.